Extreme Sunlight Readable Moving Map GPS, Dual-Band ADS-B Transceiver. Struggling to see complex and confusing In-Air Weather and Traffic can be a thing of the past for pilots with the new iFly 740b GPS / echoUAT ADS-B bundle presented by Adventure Pilot and uAvionix, two industry leaders of high-value and simple-to-use aviation devices. Pilots may choose from an iFly 740b and echoUAT with skyFYX GPS source for $1898.00 or without the Certified GPS source for $1,598.00, including free shipping. The iFly 740b and echoUAT Transceiver Bundle allows pilots to eliminate the guess work with full ADS-B Weather and Traffic on a dedicated and extremely sunlight readable aviation GPS, the iFly 740. The iFly 740b GPS boasts one of the brightest touchscreens on the market and the highest compatibility rates by supporting many of the ADS-B devices. All this on a market where a multitude of portable ADS-B devices are limited to a specific App or brand GPS. The iFly 740b Continues to Outshine the Competition! The brightest sunny day and clear bubble canopies are no match for the new iFly 740b. Perfect for those extra bright cockpits with 1100 nits of brightness to power through the sun's challenges. Never has there been such advanced hardware at such a great price. This sunlight-readable GPS won’t break the bank or your eyes! The iFly 740b now packs an internal circuit protected Li-Po battery to provide up to 30 minutes of internal backup power. Use the internal battery to perform a quick update via Wi-Fi, Check the Weather or File your Flight Plan prior to flight time. The iFly 740b is unplugged! Fast Updates and Filing from Almost Anywhere! With the iFly 740b's powerful built-in Wi-Fi capability, you can connect to a Wi-Fi hotspot and enjoy fast and easy automated data updates and Nexrad Weather. Use the new Online Flight Filing feature through Lockheed Martin Flight Services. Plan, File, Activate and Close right from the 740b. ADS-B Weather and Traffic Compatibility with 3rd party receivers such as uAvionix, iLevil, Dual, NavWorx, Clarity, Stratux and more. "Find Nearest" option to quickly find nearby airports, ASOS/AWOS freqs, navaids, etc. Sectionals maps include all "border" information, nothing is hidden. It's just like having an actual sectional map. 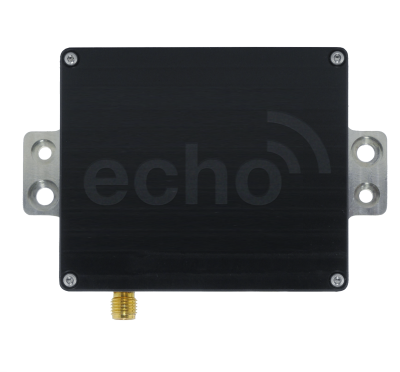 External Dimensions: 7 1/4" X 4 1/2" X 3/4"
The echoUAT is a remotely mounted ADS-B transceiver. It incorporates a dual-link (1090 MHz and 978 MHz) receiver and 978 MHz UAT Class B1S transmitter. EchoUAT features a direct wired communication for use with popular EFIS from Dynon, GRT and MGL Avionics. An integrated Wi-Fi access point also supports many popular EFB applications on iOS and Android. EchoUAT is designed to use the aircraft’s existing altitude encoder and ADS-B compliant GPS position source. The uAvionix SkyFYX GPS can be used in the event your EFIS manufacturer does not supply one. A zero-install, internal wireless monitor decodes replies from legacy Mode C transponders for maximum retrofit capability. The Echo UAT is designed to meet the performance requirements of TSO-C154c, and is compliant with FAR 91.227 for operation in the National Airspace System. Do I have to mount a bunch of antennas on my plane exterior? No, unlike some competitors, the echoUAT use a single UAT/1090 antenna for Transmit/Receive and Receive. You will need to mount the UAT In/Out antenna and a GPS antenna if you do not already have a compliant GPS source. Will I be able to see weather and traffic on my iFly Device or App? Yes, the echo transmits weather and traffic on the commonly used GDL90 data format to ensure support for most iOS and Android Apps via WiFi. Do I need to upgrade or replace my existing Transponder to use the echoUAT? Does echoUAT meet the 2020 mandate? Yes, echo does meet the FAA’s 2020 ADS-B mandate for Experimental and Light Sport Aircraft when paired with a suitable GPS position source such as SkyFYX or a 2020 compliant GPS provided by your EFIS manufacturer. Will the echo work with my Dynon Skyview? Does my GRT EFIS support echoUAT? Will the echoUAT work with my MGL EFIS?